At a high score battle the game itself won’t pay you a prize. You play only for the battle, the battle last 1000 games (in total over all players), after the 1000 games the players with highest scores get the prize. One player can win multiple prizes. 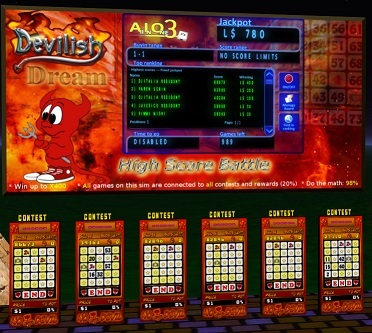 These battles are placed at Devilish Dream. Devilish Dream gives all sort of rewards, summing up to 20% from the amounts you pay. The High Score battle pays in total 78% of the amounts paid to it. So, with the high score battle you play a game where the prize money is (20+78=) 98% of the amounts paid to it. There are 6 games connected to the battle, thus 6 players can play it at the same time. The battle is open 24/7, so each can play when he feels like. The winner will receive 400 times the buy in price. So on a L$100 game, winning the battle would give L$40,000. Winning L$400 with playing a L$1 game ain’t bad either, of course. The second place is still 200 times the buy in price, 3rd place 100 times, 4th 50 times and 5th 30 times. At a high score battle the pot is fixed, the required number of games is fixed. You fight with the other players about who takes the big prizes.